Gardenart outdoor furniture collections can be found in retailer stores in France, Spain and Portugal. In garden furniture stores you will see all of our collections, which will perfectly fit in your terrace or outdoor space. For example, you can purchase our outdoor chairs, our modern double loungers or our design coffee tables. 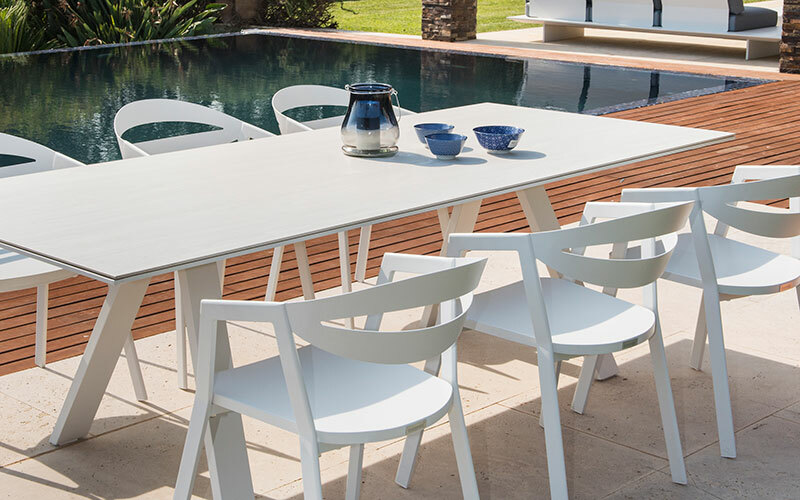 One of our hits for this summer is the La Vida outdoor chairs. We are talking about full premier aluminum chairs, so they’re light and easy to carry. These elegant outdoor chairs will compose a classy outdoor dinning set, perfect to enjoy meals and diners with family and friends. Outdoor chairs La Vida design is highly inspired in the Nordic style, so in vogue actually. Indeed, their Scandinavian style mixes right and round shapes resulting in a harmonic style easy to fit in any decor. Garden chairs La Vida are available in two different colors. White, glowing and bright, or black, sleek and gentle. These two neutral colors makes the outdoor chairs fit in any terrace style, or even perfectly fit with your current garden furniture. Since you buy the outdoor chairs La Vida, you’re also gaining a ten years warranty, the same goes to no matter which Garden Art furniture. Garden Art is proud to propose high quality outdoor furniture, made to resist inclement conditions and stand as brand new, so Garden Art stands for a ten years warranty.